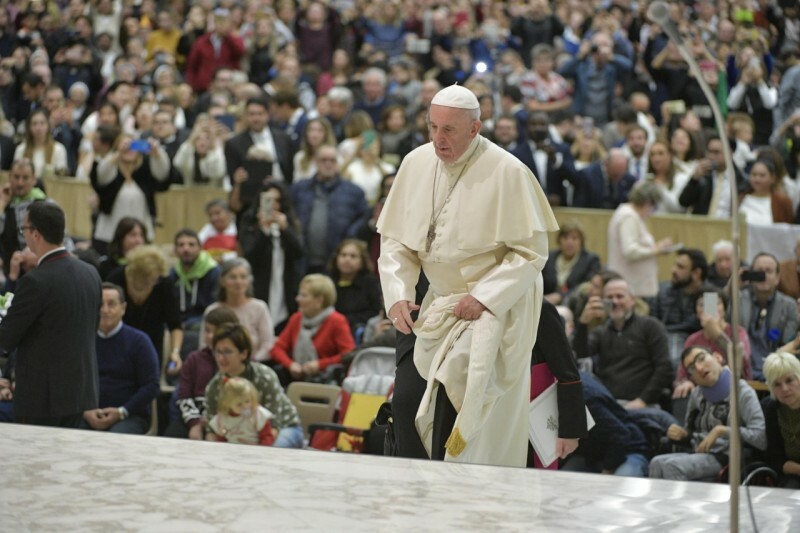 This morning’s General Audience was held at 9:30 in Paul VI Hall, where the Holy Father Francis met with groups of pilgrims and faithful from Italy and from all over the world. Beginning a new series of catecheses on the “Our Father,” in his address in Italian the Pope focused his meditation on the theme: “Teach us to pray” (Biblical passage: from the Gospel according to Luke 11:1). The Gospels have given us very vivid portraits of Jesus as a man of prayer. Despite the urgency of His mission and the urgency of so many people that claim Him, Jesus feels the need to withdraw in solitude to pray. Mark’s Gospel gives us this detail from the first page of Jesus’ public ministry (Cf. 1:35). Jesus’ inaugural day at Capernaum ended in a triumphal manner. The sun having gone down, multitudes of the sick reached the door where Jesus dwelt: the Messiah preaches and heals. The ancient prophecies and the expectations of so many suffering people are fulfilled: Jesus is the close God, the God who frees. However, that crowd was small if compared to so many other crowds that will gather around the Prophet of Nazareth; at certain times they are oceanic assemblies, and Jesus is at the center of all, the long-awaited by the peoples, the success of Israel’s hope. And yet He frees Himself; He does not end up a hostage of the expectations of those that have now chosen Him as leader, which is a danger for leaders: to attach themselves too much to people and not distance themselves. Jesus realizes this and does not end up a hostage of the people. From the first night at Capernaum, He shows Himself an original Messiah. In the last part of the night, when dawn was now breaking, the disciples seek Him again but cannot find Him. Where is He? Until Peter finally tracks Him down in an isolated place, completely absorbed in prayer. And he says to Him: “Everyone is searching for You!” (Mark 1:37). The exclamation seems to be the affixed clause to a successful plebiscite, the proof of a mission’s good outcome. However, Jesus says to His own that He must go elsewhere; that it’s not for the people to seek Him, but it is, first of all, He who is to seek others. Therefore, He must not put down roots but remain continually a pilgrim on the roads of Galilee (vv. 38-39). And also a pilgrim towards the Father, that is, praying, going on the path of prayer. Jesus prays. And it all happens in a night of prayer. In some page of Scripture, it seems to be first of all the prayer of Jesus, His intimacy with the Father that governs all. It will be so especially in the night of Gethsemane. The last stretch of Jesus’ path (absolutely the most difficult that He has done up to then) seems to find its meaning in Jesus’ continuous listening to the Father. It was a prayer that was surely not easy but, rather, a true and proper “agony,” in the sense of the competitiveness of athletes, yet a prayer capable of sustaining the way of the cross. Here is the essential point: Jesus prayed. Jesus prayed intensely in public moments, sharing the liturgy of His people, but He also sought secluded places, separated from the whirl of activity of the world, places that allowed Him to descend into the secret of His soul: He is the Prophet who knows the stones of the desert and goes up high on mountains. Jesus’ last words before expiring on the cross were words of the Psalms, namely, of prayer, of the prayer of the Jews: He prayed with the prayers that His Mother had taught Him. Even if perhaps we have prayed for many years, we must always learn! Man’s prayers, this yearning that is born in such a natural way from his soul, is perhaps one of the densest mysteries of the universe. And we don’t even know if the prayers we address to God are, effectively, those that He wills to have addressed to Him. The Bible also gives us testimony of inopportune prayers, which in the end are rejected by God: suffice it to recall the parable of the Pharisee and the publican. Only the latter returns home from the Temple justified because the Pharisee was proud and he liked to have the people see him praying, and he feigned to pray but his heart was cold. And Jesus says: he was not justified “for every one who exalts himself will be humbled, but he who humbles himself will be exalted” (Luke 18:14). The first step to pray is to be humble, to go to the Father and say: Look at me, I’m a sinner, I’m weak, I’m bad,” each one knows what to say. But one always begins with humility, and the Lord listens. The Lord listens to a humble prayer. Therefore, beginning this series of catecheses on Jesus’ prayer, the most beautiful and most correct thing that we must all do is to repeat the disciples’ invocation: ”Master, teach us to pray!” It will be good, in this Season of Advent, to repeat it: “Lord, teach me to pray.” We can all go a bit further and pray better, but we must ask the Lord for it: “Lord, teach me to pray.” Let’s do this, in this Season of Advent, and He will surely not let our invocation fall into the void. I’m happy to receive the Daughters of Our Lady of the Sacred Heart and the parish groups, in particular, those of Sant’Elia a Pianisi, of Rome and of Pescara. I greet the Nice Cavalry Regiment, of Bellinzago Novarese, the elderly pensioners circles of the province of Trento and the 70 year-olds of Paterno di Lucania. Next Saturday we will celebrate the Solemnity of the Immaculate Conception of the Blessed Virgin Mary. Let us entrust ourselves to Our Lady! May She, as the model of faith and obedience to the Lord, help us to prepare our hearts to receive the Child Jesus on His Christmas.